It was a cold day in California. Hubby assembled the tree, literally. The box of ornaments was down from the closet. Each precious piece distacting us from what was about to take place. An evil squeal of delight was heard. There had been an invasion. Once up, was now gone. A trail of artificial pine sprinkled the carpet. A spot, approximately 3 feet high on the tree, bare. The perp, a pig-tailed todder, with a quick hand. Her jet loaded with the goods. Probaly headed to Mexico. Or Cuba. Or McDonalds. We think she's working with a partner. She goes by the name of "Darby." 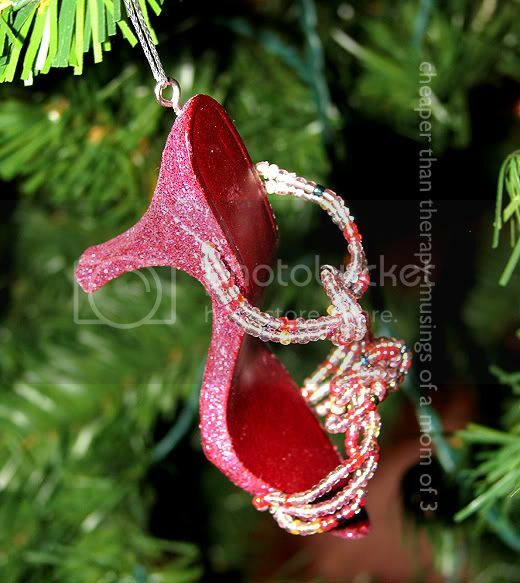 I love the glittery shoe ornament. Cute! Nice photography btw of the ornaments! What kind of camera do you use? lol..too funny! Gotta love those 2 year olds. Love your shoe ornament! aha! I knew my 19 month old must've had an accomplice! It must have been Darby because surely he couldn't have removed all of our ornaments by himself so quickly. Hilarious. We have that same damn airplane that sings "high and low high and low"
That i adorable!!! Girls cannot resist sparkly things!! ps. love the shoe ornament! Sorry, but I'm laughing hysterically right now! These are the good times...thanks for prompting me to take a walk back in time to when my children were little. Hope there wasn't too much of a mess. That is hilarious!!!! Grayson last year stuck an empty roll of toilet paper on on the bottom branches. He was so proud. Super cute ornaments! and how cute of her to want to travel with them! K and bay M would be a perfect team, thier mission... drive their mama's batty!! Funny stuff...maybe she just needs her own tree...At least they aren't alone...lol. Thats funny. My 1 yo keeps sneeking ornaments off of our tree and scattering them throughout the house. And that shoe ornament is fabulous! Love it! Hahahahahahaaa! Love your pimped-out photos...Santa-hat style!! I love it! This is hilarious! BTW, I too, love the red high-heel ornament! Too cute! What a fun story.!. I hear ornament stealing is the newest gang initiation. :D Cute ornaments. I love to see other peoples trees. HAHAHAHA!!!!!!! I'm sorry but I just laughed really hard! That is so funny! Love those ornaments! I totally would have chose those same ones...ballet, coffee, cute heel! I love the shoe ornament. Hope she clears customs. The street value of sparkly baubles has really gone up in South America. You gotta watch out for the Black Market Happy Meal toy kingpins. They will bite your ankles and be gone before you know what hit ya! LMAO! Keeg does the same thing! 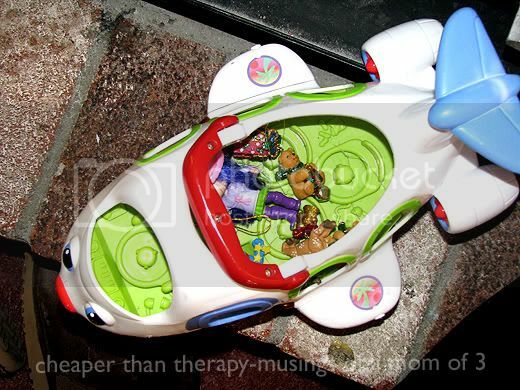 The ornaments take a ride in our Little People plane! LOL! How cute! I love the shoe ornament! i think ihave lost about 25 this way. Perhaps they have hitchhiked. Yeah, I lost the train that goes around the tree...toddlers...got to love them! Too cute...love how she took off with the ornaments! Adorable! I love this post! You have to admit though, it's kinda funny! You'll miss this, trust me. Ha ha ha! Oh! I am so sorry! That sounds like my home! 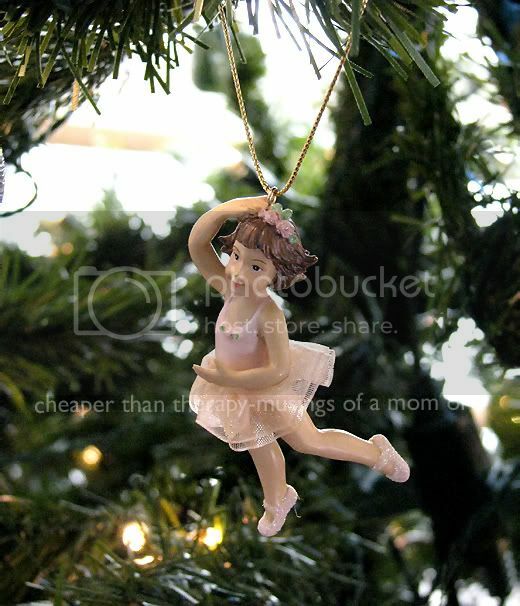 My 4-yr-old has the same ballerina ornament! Great pics! Haha, too cute! 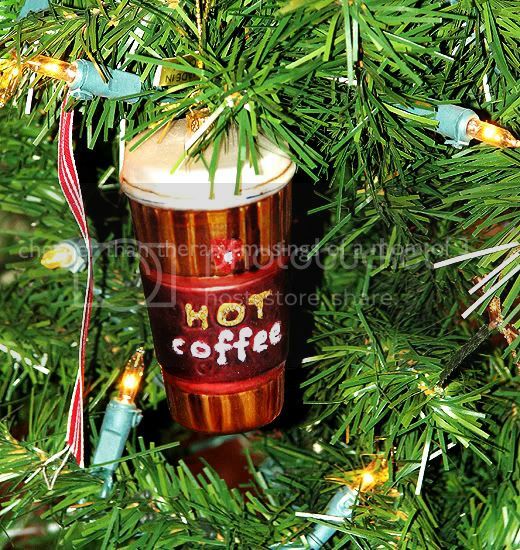 Love your ornaments! OH how I love me that shoe ornament!!!! adorable- I love the way you wrote that- Beebs favs are the musical Elvis ornaments- It so loud it could wake the dead and she plays it about 18 times a day! he he, I have a collector too and he even gets into my jewelry! I love the way the pictures tell the story! The culprit was caught red-handed. This is adorable. I have not put one ornament on the tree yet, for that very reason.. It still looks nice with only lights..
Love it!!! I told Lulu they were "hot" and she believed me. Yay me! Those ornament pictures are amazing - magazine quality, I tell ya! We were playing the "oranment shuffle" game around here earlier tonight... I love that she has a accomplice.